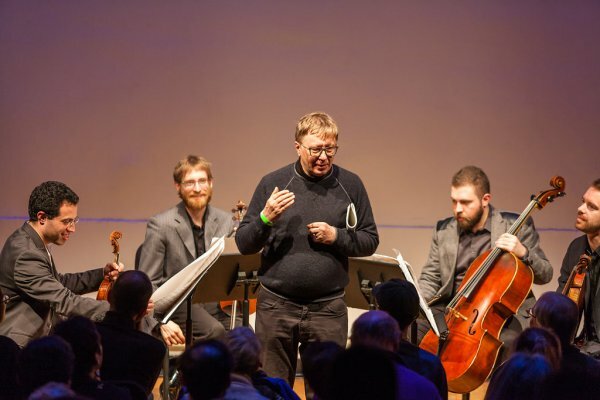 Since September 2013, when he was appointed MacDowell Professor of Music at Columbia University, Georg Friedrich Haas has made himself an integral part of the Columbia University and New York City contemporary classical music world. The United States premiere of his most recent work, Quartet No. 8, on February 24, 2015 was thrilling. The complex work is virtuosic – alternately disturbing and pacific – as it explores themes of present engagement with the personal and historical past. Haas’ remarks to the audience were conversational, teacherly and engaging. Taken together, the piece itself and Haas’ discussion of it made the origins of his popularity with colleagues, students and general audiences obvious. The JACK Quartet, consisting of violinists Christopher Otto and Ari Streisfeld, violist John Pickford Richards, and cellist Kevin McFarland, played brilliantly. The structure of the early evening concert was simple, sensible, intimate … and exhilarating. The JACK Quartet was seated on the stage, as were several rows of spectators; more spectators were in the auditorium proper. The concert consisted of three parts: first came the world premiere of the new twenty-minute quartet, then an informal discussion by the composer, then the second performance of the new quartet. What a treat, to hear a new work … twice! The piece is almost continuous: there are no distinct movements, though there are discernible sections caused by shifts in tone and intention. Haas’ complex music is microtonal – he said in the discussion, “Of course, everyone loves microtonality!” – and it initially sounds, for those new to microtonality, unnerving. Traditional chords coexist with other kinds of chords, fragments of what used to be the octave norm, as well as other kinds of scales until the microtonal project gradually becomes identifiable, intelligible, and less disconcerting. Musical notes and tones exist in infinitely close proximity; traditional Western octaves begin to seem like an inadequate architecture; and notes’ relationships with each other on the now densely populated continuum from low to high emerge as new ways of hearing sound and exploring musical meaning. And what JACK successfully did was to convey Haas’ intentions and goals – as they do with the music of all the contemporary composers whose works they perform – with technical brilliance and compassionate, graceful artistry. JACK’s international reputation for consistent musical excellence is well deserved. The four instruments were played in every possible combination of conversation, consensus, conflict and final concert. Whether bowing or plucking strings, the musicians managed a huge range of dynamics from nothingness to wild crash and back while intricate rhythms continued to explore and expand the tensions and relationships among multiple chords, tones, harmonies, dissonances and resolutions. The music of the piece ended in a slow, gorgeous progress from a loud complexity of chords and rhythms so dense that one could barely keep track of its insistent, divergent elements to an increasing piano: various musical lines gradually dropped out until quiet and then a total silence were created. The silence itself was so powerfully palpable that at the end, musicians and audience alike stayed unmoving for a full two or three seconds before audience applause broke out. Haas then came to the stage and began to talk about his work. He started by thanking JACK, and then, somewhat tentatively began discussing the quartet. From a description of his music, he moved to an examination of influences on his work: he focused on the German lyric Romantic poet Friedrich Holderlin (1770-1843) and then expounded on the unusual ability of German poets to integrate the rhythms of ancient Greek poetic scansion with modern German metre in poetry, a feat almost impossible in English. He identified this wedding of ancient scansion with modern metre in Holderlin’s poetry as a project similar to his own approach to composition, in which demanding rhythms are made to inhabit and animate the subtle and complex explorations of microtonality. Haas mentioned especially one of Holderlin’s most famous poems, “To the Fates,” lovingly reciting some of its lines and identifying especially the poem’s revelation of poignant yearning to live life as the ancient gods once lived it as a motivation for creating art. The second playing of the quartet immediately following Haas’ comments was a different experience from the first playing. 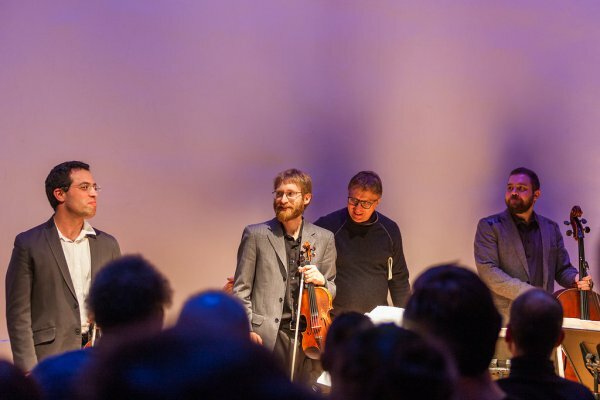 Hearing the music a second time was like embarking on a friendship with an acquaintance; and Haas’ discussion of Holderlin’s “To the Fates” illuminated the quartet’s themes of artistic introspection, and personal and historical remembering. The format of the early evening made the experience a combination of modern seminar, nineteenth century salon and regular concert. The superb music, superbly performed, was a revelation about both music composition and artistic creativity. Haas and JACK transformed the densely cold, dark February dusk into an inspiration.